There, I said. I just don’t like breakfast. I’m deathly allergic to eggs. I don’t like oatmeal, I’m not a fan of protein bars and I get ravenously hangry in just a couple hours if I eat toast or smoothies or similar high-carb meals. I know I often preach that breakfast is important for literally ‘breaking the fast’ and giving you the nutrients you need to tackle the day ahead and it is. When done right, breakfast can be a great way to get high-quality protein, healthy fats, and ample antioxidant-rich plant foods into your belly. And sometimes I DO eat breakfast, usually a meat and veggie hash or leftover soup, or sweet potato toast with avocado and smoked salmon, but only if I’m not going to be heading out the door for my morning CrossFit workout or I don’t have a billion things to take care of between opening my eyes and getting the kids to school on time (which is pretty much to say ‘5 days a week’). Thus, I’m left with only two options on those days: fast or add some fat and protein to my morning brew (which I’m not going to skip no matter what I’ve got planned). Obviously, I’m going to take the later because fat + protein = fuel for my workout and my morning. 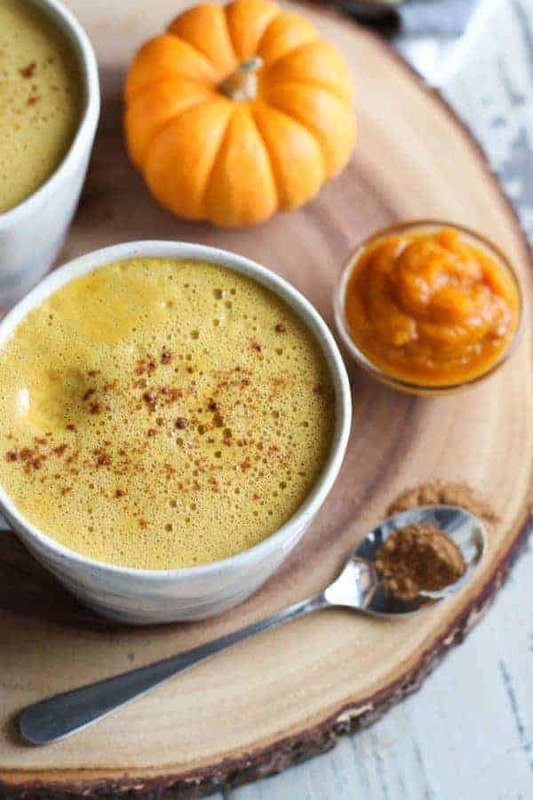 Lately I’ve been caught up in the whole pumpkin spice buzz so this recipe is naturally going to feature pumpkin and spice. 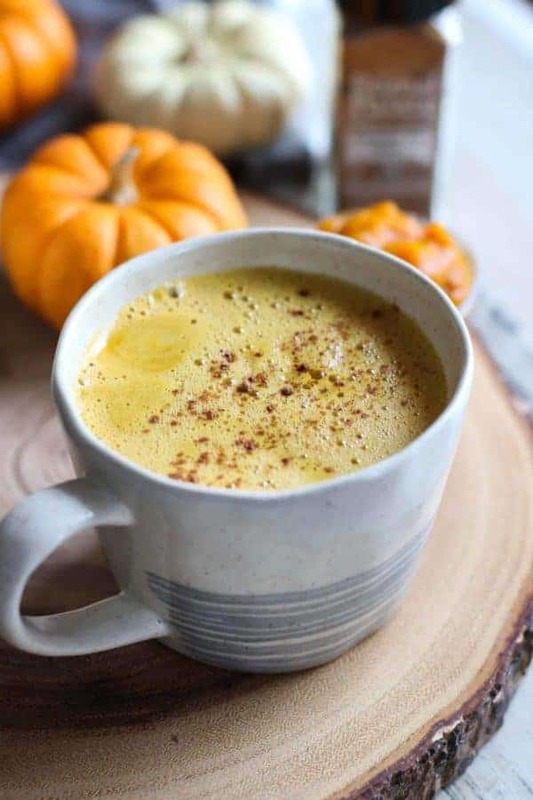 However, feel free to tweak it to your tastes – leave out the canned pumpkin if you don’t have any or don’t like it, add more or less spice, substitute coconut oil for ghee if you want to make it vegan, use decaf coffee or strongly brewed black tea or add a bit of honey or maple syrup if that’s your thing (it’s not mine so I left it out of the recipe but by all means, you do you). Other than the aforementioned disenchantment with breakfast, I love butter coffee (or ‘Bulletproof coffee’) for its convenience and taste. Oh, yes….it’s taste. It’s so rich and creamy and I have to admit that I almost prefer it over my beloved coffee and heavy cream (which I’ve broken up with following this last round of Whole30). I also love that I can start the day with a healthy dose of protein using collagen peptides. Just 1 scoop provides 35 calories and 9 grams of protein from collagen sourced from either the hides of grass-fed, pasture-raised cows. I case you’re wondering, I’m not ‘Keto’. 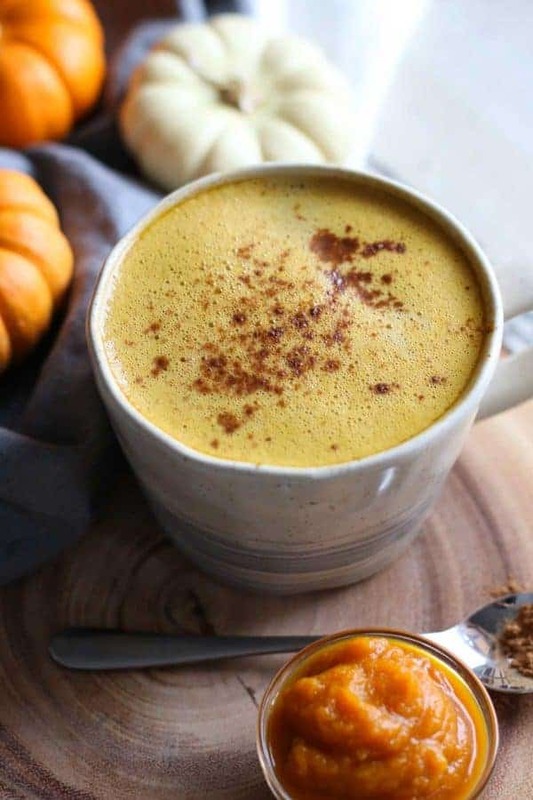 I don’t use my Pumpkin Spice Butter Coffee as part of an intermittent fasting protocol (though I could) I just prefer to start my day this way because it’s easy, it’s fast and I can make it through my workout with feeling heavy or full. 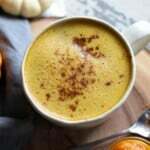 I find that I don’t get hungry for about 3-4 hours after drinking this and when I do, I opt for an early lunch and plan to have a snack later in the day (usually a small portion of a meal or some veggies with hummus). I also love that I can just throw it all in the blender and let ‘er rip. I usually add boiling water to my favorite travel mug to preheat it while the coffee is brewing – and if the kids are still asleep and I don’t want to wake them, I skip the blender and use this amazing little frothing wand (it’s got some serious horsepower) to get everything blended and super frothy. I supplement my diet with collagen peptides almost daily for its many health benefits including healthier skin, hair, nails, joints, ligaments, tendons and improved digestion and immune system. It’s my go-to protein supplement because it’s free of dairy, eggs, nuts, and soy. Bottom line: Life is too short to always play by the rules (in this case, starting your day with a ‘real’ breakfast). Sometimes you just have to do what works best for you right now and if it stops working, then step back and re-evaluate. Nothing works perfectly forever. Who knows? 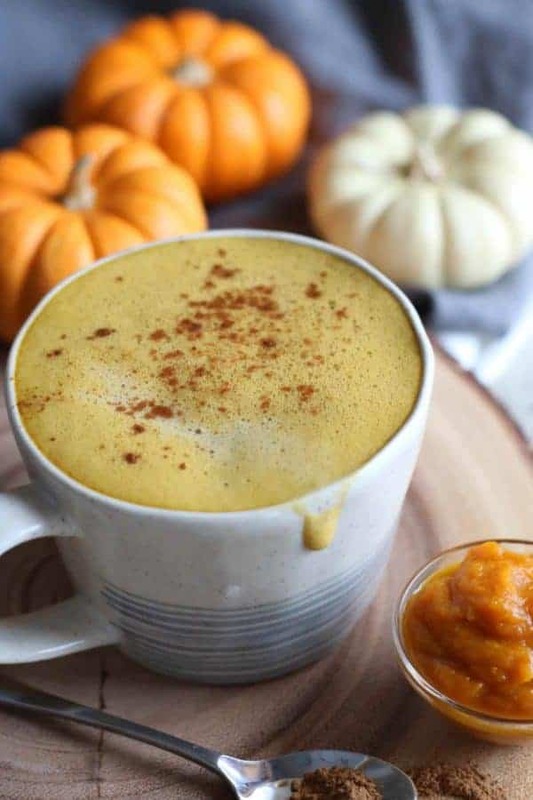 I may be back to eating breakfast on the regular next month…though I doubt it given how incredibly delicious, creamy and satisfying this Pumpkin Spice Butter Coffee is. Give it a try – it just might be your thing, too! Place all ingredients in a blender and blend on high speed until frothy. 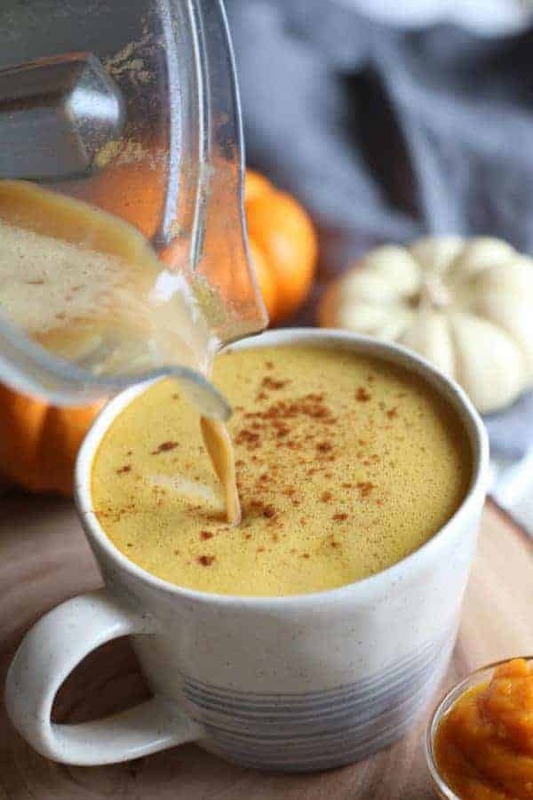 Pour into your favorite mug and sprinkle with additional cinnamon, if desired. How do you start your day? Are you a breakfast lover or do you prefer something else like butter coffee to jump start your day? Leave a comment below. What are your thoughts on having this for a snack? Yes, you could definitely have this as a snack. If it’s in the afternoon, you may want to use an organic decaf coffee. If we wanted to use coconut oil instead of thee, what kind should we use? You want to use an organic unrefined coconut oil. Hope you enjoy! Can you use Kerrygold butter instead of ghee?